Though Rheumatic Diseases are the leading cause of loss of productivity and morbidity among those in the working age group (ages 20-35), the national health programs do not include rheumatic conditions among the priority list of diseases. Sad to say, general lack of public awareness equates to inadequate healthcare delivery to those afflicted with rheumatic diseases. This compromises the early detection and treatment of the more serious conditions such as systemic lupus erythematosus (SLE), rheumatoid arthritis, connective tissue diseases and spondylo arthropathies like psoriatic arthritis. Lupus is an auto-immune disease that has no definite pattern of manifestation. In lupus, the immune system attacks tissues in various parts of the body. This abnormal activity leads to tissue damage and symptoms differ greatly per person. People with lupus often also develop specific problems when the immune system attacks an organ or body area. The joints, skin, blood and and kidneys are those usually affected by lupus. Patients with severe lupus need proper medication to control their flare-ups and live productive lives. People Empowerment for Arthritis and Lupus (PEARL) media forum was held earlier today in Makati City to raise public awareness. Among the participants were lupus and inflammatory arthritis patients, rheumatology fellows together with PSORPHIL, LUISA and PEARL advocates. Why is Psoriasis Philippines (PSORPHIL) working closely with PEARL? It is because between 20% to 40% of people with psoriasis suffers from the debilitating Psoriatic Arthritis. PEARL is an advocacy led and composed by the concerted efforts of impassioned healthcare professionals, patients and caregivers that is envisioned to be a long standing movement for the betterment of the plight among individual with chronic rheumatic conditions locally with a global perspective. Specific programs have been laid out and initiated namely the Arthritis and lupus Clinics with specialty medical consultations, lectures, and support group activities. Lupus Inspired Advocacy (LUISA) has been at the forefront of championing the causes of persons afflicted with Lupus or SLE in the Philippines. It promotes and protects the interest of patients with systemic lupus erythematosus in the country. LUISA founders by Dr. Sandra V. Navarra and Ma. Luisa Cojuangco-Cruz, had taken the organization to greater heights since then. Highlights of which is successfully earmarking February as Lupus Advocacy month via a presidential proclamation. 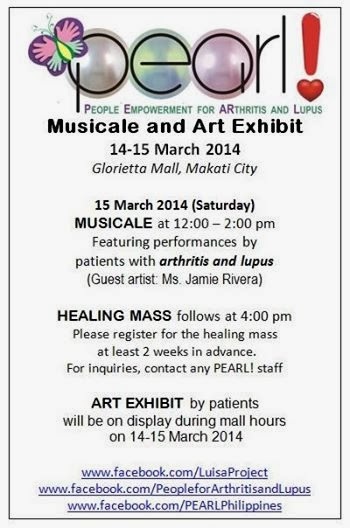 LUISA has partnered Psoriatic Philippines (PSORPHIL) Chairperson Mr. Josef de Guzman to celebrate the unique artistry of patients with lupus and arthritis this coming March 15, 2014 via PEARL's "The Patient, The Artist Musicale". Mark your calendars and head off to the PEARL! Musicale and Art Exhibit at Glorietta. Get to meet people who live with these diseases and learn more how the disease affects them. I have people very very close to me who have lupus. :( sayang i have another event on the 14th.